Javier Moraga (Viña del Mar, Chile) was born in 1976, a key moment in rock music and its practice, when a first wave of independent artists embraced a "do it yourself" éthos. After a short period studying law in Valparaíso, he finally decided to devote his energy towards music, which expressed first by a tireless curiosity for new styles and permanent sharing among his friends' circle and local musicians. He became a sound technician and has been working at Universidad de Valparaíso radiostation "Valentín Letelier" (97.3 FM), and started exploring musical creation by himself. 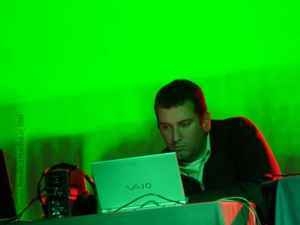 After playing keyboards in Olor A La Banda - one of the most interesting projects coming from Quinta Región during the early 2000 – he finally chose electronic music as a canvas for expression. Moraga has released "Autodidáctico" (2006, Niño Records), "Toma Distancia" (2007, Amp-Recs), "666,777,888" (split with Los 5000, project by Mostro member Carlos Reinoso (2007, Horrible Registros), and "Lunáptico" (2008, Epasonidos), albums that present a personal sound, moving from experimental to industrial, adding a subtle and charming rhythmic approach. "Sofismo [pn034]" (2008, Pueblo Nuevo) is a new step in this continuous flow of material. The title of the work is a wordplay based on the name of her newborn daughter's name (Sofía), and the ancient Greece philosophic current, where, using apparently sensible arguments, reality was explained in a false and biased manner, taking knowledge into uncertainty and relativity. Sounds familiar, isn't it? English version by: Gerardo Figueroa.